Hi I just noticed that IKEA UTRUSTA is running 2,4GHz - 2,4835 GHz - just wondering if anyone have played with mysensors to control such an IKEA device if it's possible at all? A few websites state this things are 433mhz, ikea itself states it is 2,4ghz. Would be interesting to crack open one of these things. is the wireless reciever simply an on off switch? @bjacobse According to this guy it contains a TI CC2500 transciever and MSP430G2221 microcontroller. This guy claims it suffers from WiFi interference. This remote control has a maximum range of 19.5 ft. when not blocked by walls and batteries are fully charged. Frequency range: 2400 MHz ~ 2483.5 MHz. @Yveaux Hi ! I'm the guy from AlsaGeek. I confirm, CC2500 2.4GHz transceiver + MSP430G2221 microcontroler. CC2500 is a transmitter on the remote but it can work on both direction ! You can have a remote control that receive information. The MSP430 is programmable !!! You have 4 pins on the PCB (GND, VCC, RESET, TEST) and you can reprogram the remote control with MSP-EXP430G2 lauchpad kit. It works ! But... MSP430G2221 only have 128 bytes of RAM. The CC2500 driver use a full duplex 64 bytes buffer, so it will not work. I made it work by reducing the buffer to 4 or 5 bytes ! Pretty small, but it works ! I'm working on a "HowTo". Of course, you can change the MSP430 and put a bigger one. And of course, you can remove the MSP430 and connect an Arduino or any other SPI capable microcontroler. @Blob Nice work, how is the how to guide going? I'm very interested to implement the IKEA Utrusta lighting in my home automation setup. I wrote a MicroPython driver for the Ansluta one and can give you some details I learned along the way. The $20 Ansluta one-button remote uses a 2.4GHz TI CC2500 to transmit one of four 6 byte commands. I am using it to control 10W and 30W Ansluta transformers with Forbattra under-kitchen-cupboard LED panels. It seems the whole Ansluta range is using 2.4GHz CC2500 chips, while the Utrusta range was on 433MHz. Each time you press the remote's button, it cycles through 0%, 50%, 100%, 50%, 0% brightness. The inspiration for writing my own driver was so that I could go straight to 100% brightness, and use a microcontroller with PIR and timer to illuminate the panels. To pair, hold down the pair button on the transformer until it blinks. Then press and hold the remote button to send the pair command. After that, the transformer only listens to commands from the remote's unique 16-bit address. The remote's unique 16-bit address can't be changed. I sniffed the pair command from a few lights inside IKEA and can confirm each remote has a unique address. One remote can control multiple transformers, if you pair the remote with each. Each transformer can only listen to one 16-bit remote address. The transformers can also be chained. When you press the button on the remote, it sends the command 50 times to ensure the receiver is awake and receives it. Communication is unidirectional. Remote -> Transformer. There is no acknowledge or data sent back from the transformer. You can adjust the TX power of the CC2500 in code. Set register 0x3E to 0xFF. I am not sure what the original TX power level of the one-button remote is, but it works from at least 5m away. I made a breakout board for making a CC2500 module breadboard friendly, available on OSH Park for around $3.50 for 3x. The U1 G2231 chip is the MSP430G2221 microcontroller. The U2 chip is the CC2500 transceiver. The Q1 chip in the bottom corner controls the LED brightness. Fairchild FDD8880 30V N-channel MOSFET. hmm.. interesting, that they chose that FET.. According to datasheets then the MSP runs at max 3V6 (I guess they use 3V3 here, the chip marked 8A637 is probably a LDO). 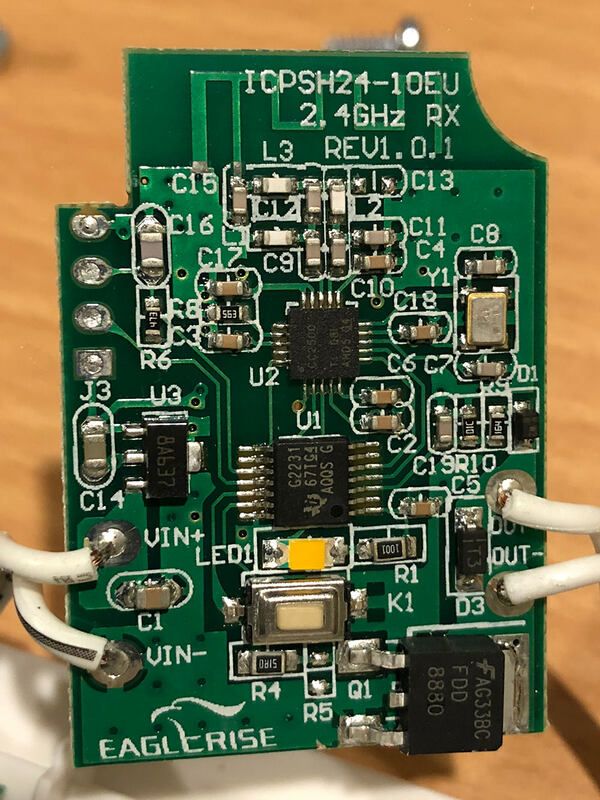 The chosen FET is performing best as a switch with Vgs above 4.5, 4.5V RdsON is 12mOhm, but it will raise quickly as the Vgs voltage is lowered below this threshold.